All Forums >> [Artix Entertainment Games] >> [AdventureQuest] >> [AQ Encyclopedia] >> Weapons >> Blade of Awe!!! Shields: Shield of Awe, Shield of Awe!!! Obtaining a regular weapon of Awe, and then purchasing AWE Weapon Upgrade!!! If you have any weapon of Awe!!! or an Ultra!! 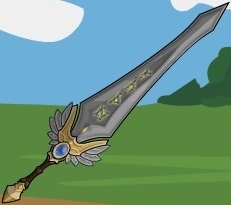 !Guardian Scythe, you can swap it for this by visiting Valencia Grumbugly and paying 20 Z-Tokens. The weapon's Base and Random damage increase based on your Level*. This affects all normal player attacks and weapon specials. The Blade of Awe has an overall 10% chance to perform one of 6 unique specials. You can talk to Valencia to align your weapon to only perform a specific special when the special procs. Each special gains a bonus for doing this. HEALTH VAMPIRE: Heal damage equal to 150% of the damage inflicted. MANA VAMPIRE: Heal MP equal to 1.4*[MPHeal]. SOUL VAMPIRE: Heal SP equal to 1.4*[SPHeal]. GUARDIAN DRAGON: The weapon's proc rate increases to 16%. Power Word Die: The weapon's proc rate changes to 4%. *The weapon grows to match you in power! It does «» damage and +«» to hit. The wielder of this legendary artifact is granted massive power. Even death is subjugated by this awe inspiring magical blade. The blade does extra damage the higher your level. The owner of this weapon won the blade as a prize! Numbers thanks to In Media Res and Kamui. SPIRAL CARVE: With three equally powerful hits, each hit does *1/3 damage. AWE BLAST: Deals *0.85 damage to pay for the auto-hit. With three equally powerful hits, each hit does *1/3 damage. HEALTH VAMPIRE: Deals *0.5 damage. You heal HP equal to the damage inflicted divided by the monster's element modifier. If you're at 75% health or higher, then you do Spiral Carve instead. MANA VAMPIRE: Deals -5/8 damage. If it connects, you heal MP equal to [MPHeal]. At the beginning, it checks whether or not this'll heal you above your max MP; if it does, then you do Spiral Carve instead. SOUL VAMPIRE: Deals -5/8 damage. If it connects, you heal SP equal to [SPHeal]. At the beginning, it checks whether or not this'll heal you above your max SP; if it does, then you do Spiral Carve instead. All this has ALREADY been factored in to the numbers below. ??/??/04(? ): The weapon was released. July 4, 2011: The weapon stats and art were updated. See revision for older stats. August 10, 2018: The weapons stats and art were updated. See revision for older stats.